Two potential mega-blockbuster opportunities make this the biotech stock to watch. When Biogen (NASDAQ:BIIB) slashed its revenue growth projection last month, it lost almost $20 billion in market capitalization before most of us finished breakfast. Mixed data from a mid-stage Alzheimer's candidate didn't help matters, but an abrupt slowdown in sales of the company's main growth-driving drug, Tecfidera, really spooked the market, shaving off more than one quarter of Biogen's market cap. The slowdown is significant enough that management lowered the mid-range of its full year EPS estimate from $15.65 to $14.48. I would hardly expect the market to swallow this information and smile, but the guidance adjustment hardly seems to justify such a steep loss for the stock. So why all the pessimism? One reason is a perceived lack of opportunities in Biogen's pipeline. While Biogen may not have as many potential blockbusters coming down the pipe as fellow blue-chip biotech Celgene, it isn't carrying a sky high valuation either. At just under 20 times trailing-12-month earnings, Biogen has a valuation in line with the average stock in the S&P 500. Join me for a closer look at what's coming through the pipe and I think you'll agree this industry leader is anything but average. Last December, Biogen had Wall Street fizzing over data that suggests it has an Alzheimer's winner on its hands. To date there are no effective therapies that prevent the disease from progressing. One reason is a lack of understanding of the disease's cause. Accumulation of misshapen beta amyloid proteins in the brain are strongly associated with dementia, although whether the plaques are the cause, one of several causes, or merely a symptom is not entirely clear. Just a few years back, Eli Lilly raised doubts when its Alzheimer's candidate solanezumab effectively reduced amyloid plaque formation but failed to slow cognitive decline. That's why all eyes turned to Biogen this spring, when results from a mid-stage clinical trial with aducanumab showed a statistically significant reduction in both. Just as importantly, it appeared that effectiveness was dose dependent. After all, if taking more of the drug leads to a stronger intended effect, there's less chance that outliers are providing false hope. Patients receiving 3 mg per kilogram of body weight showed improved function, but not strongly enough to show a statistically significant improvement over placebo. Patients receiving 10 mg per kilogram of body weight easily reached the threshold for statistical significance, but there's a problem. The higher dosage is linked with amyloid-related imaging abnormalities that can result in brain swelling, which was the most common reason patients discontinued the study. Biogen later enrolled 30 more patients into a 6 mg arm, hoping it would show improved function without the abnormalities. This dosage's group of patients failed to show statistically significant improvement over the control group, but with just 10 patients receiving placebo, it's hard to draw any solid conclusions from the results . Hopefully, the relatively small number of patients is to blame for the mixed data. The company is betting heavily that this is the case, with two phase 3 trials expected to enroll 1,350 patients each. It will be a while before we know, as the company doesn't expect to finish collecting data until early 2020. Coming up much earlier will be data for Biogen's anti-LINGO-1 program. It's receiving far less attention than aducanumab but still has the potential to transform the lives of multiple sclerosis patients. If you're unfamiliar with MS, it's an autoimmune disorder that leads to the destruction of the myelin coating surrounding nerves that is vital to their function. Existing MS therapies, such as Tecfidera, slow progression of the disease by suppressing the immune system but do nothing to repair damage. This is what makes anti-LINGO-1 such an exciting opportunity for Biogen. To date it is the only treatment shown to repair myelin, although that statement comes with a number of caveats. First of all, the trial showing evidence of remyelination wasn't in MS, but another autoimmune disorder called acute optic neuritis. During the trial, patients exhibited improved nerve function in terms of the time required for a signal to travel from the retina to the brain. This suggests myelin repair, but there wasn't a significant change in thickness of the retinal layers or visual function. Again -- one result points to success, and others frustrate. But you won't need to wait much longer to see what anti-LINGO-1 can do for MS. Biogen is in the middle of a phase 2 trial involving 418 patients with relapsing-remitting and secondary progressive forms of the disease. For the trial to be considered a success, patients will need to show improvement in at least one of four tests. We should know if that's the case when the company starts reading out the data sometime next year. If anti-LINGO-1 or aducanumab win approval, they would effect a massive shift in their respective treatment paradigms. Without any disease-modifying therapies for Alzheimer's currently available, estimating the overall sales potential for aducanumab is a guessing game. Figures in excess of $10 billion per year aren't unusual, but that's just a fraction of the $153 billion the Alzheimer's Association estimates Medicare and Medicaid will spend caring for patients with Alzheimer's and other dementias this year. Estimating the potential for anti-LINGO is a bit more straightforward. Biogen's own Tecfidera slows disease progression but doesn't repair damaged nerve tissue. Following FDA approval in March 2013, sales of Tecfidera reached $883 million in the second quarter of this year alone. If anti-LINGO can truly improve nerve function, it would easily trump this success. A win for either of these programs, however, is far from guaranteed. Given general failure rates seen in drug development, the odds are stacked against them. The good news is that it appears the market isn't expecting a win for either. At about 20 times earnings, the company looks relatively cheap even if these two programs were completely off the table. 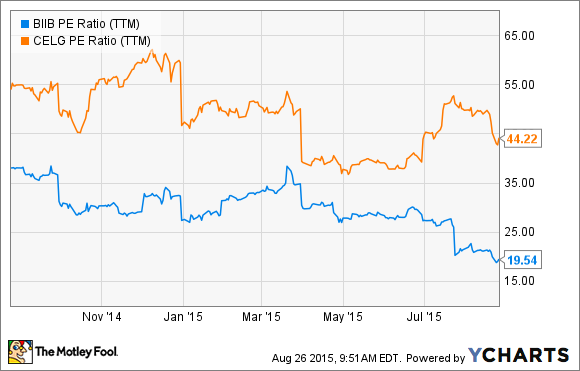 If just one of the two succeeds, Biogen investors will be laughing all the way to the bank.